Posted by Brittany Bosher on Wednesday, May 31st, 2017 at 1:44pm. The PGA Junior Golf Camps are specially designed to help young golfers develop their technical skills, improve course management and understand the game of golf in a fun and challenging environment. 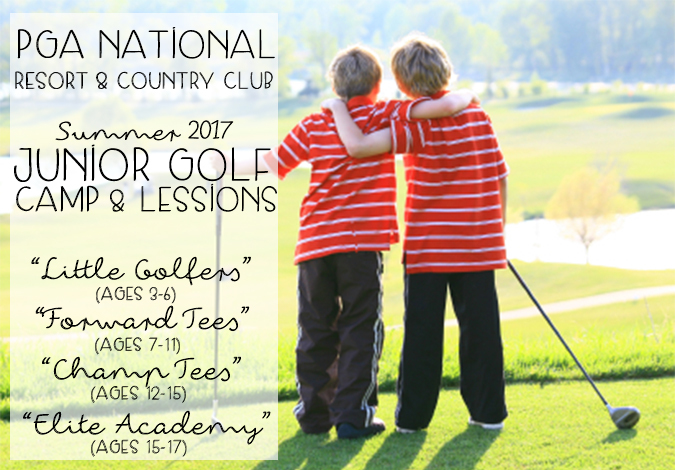 There are both full and half-day camp options for youth golfers of all ages, as well as camps for the more advanced youth golfers. The golf camps offered here are some of the best locally and nationally and provides your young golfer the opportunity for serious game improvement and leadership on the course and off. Divided into different skill level camps and age groups, each young golfer can fine tune their game and skillset with the right coaches. The programs range from intorductory levels to advanced levels. All of the programs and coaches at PGA National are devoted to educating, refining talent and letting each kid have FUN! Some of the camps include lunches in the price as well as access to the other amenities on the grounds.